In 1993 a crop formation at Cherhill, England was discovered in which some of the epicenter plants were coated with an iron "glaze," composed of fused particles of apparent meteoritic origin. This coating consisted of comingled iron oxides (hematite and magnetite) fused into a heterogeneous mass, which was actually embedded in some of the plant tissue. 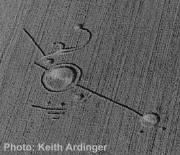 This crop formation formed during the annual August Perseids meteor shower. Levengood and Burke hypothesize (see "Semi-Molten Meteoric Iron Associated with a Crop Formation") that microscopic particles of meteoric dust (which are filtering toward earth constantly as meteors burn upon entering the earth's atmosphere, and which would be more abundant during an actual meteor shower) were drawn into the descending plasma system by the strong magnetic fields known to be associated with plasmas, then heated to a molten state by the microwaves (also known to be associated with plasma systems) prior to impact with the earth's surface. 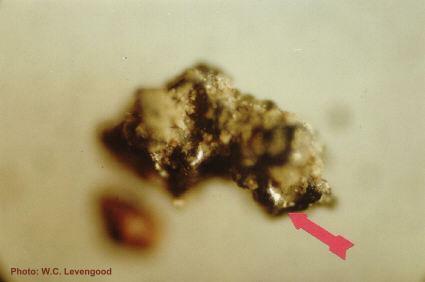 Photomicrograph (100 X) of soil from a crop circle showing traces of melted magnetic material adhering to soil grains. 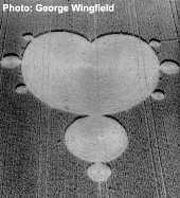 After this 1993 discovery, regular soil sampling was instituted at most crop circles sampled by the BLT Team. Subsequently, tiny 10-40 micron diameter spheres (and/or partially ablated particles) of unusually pure iron have been regularly found in soils from crop circle sites. 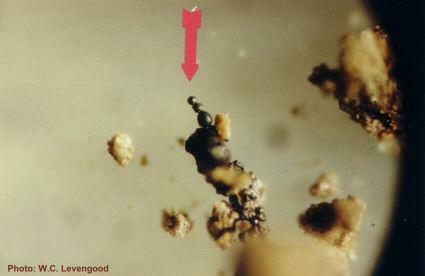 Sometimes clusters of these very small, perfectly spherical, magnetic particles are found; sometimes larger spheres (40-50 microns in diameter), which are strongly magnetic, are discovered adhering to bits of soil covered, or inter-mixed, with a partially-melted glaze of the same material. reveals they were formed in a magnetic field. Most often these highly magnetized spherical particles are found clustered around (or just outside) the perimeters of circularly-shaped crop formations, suggesting that centrifugal force is distributing this material out toward the edges of the flattened areas. However, we have also examined a few cases in which the major deposition of the magnetic material has been in the centers of the flattened circular components. Most interestingly we have found a few instances of linear deposition of these magnetic particles, usually with the particle amounts increasing as one samples out toward the perimeters of the circles--again suggesting a rotating force (a spiraling plasma vortex?) as the distribution agent. 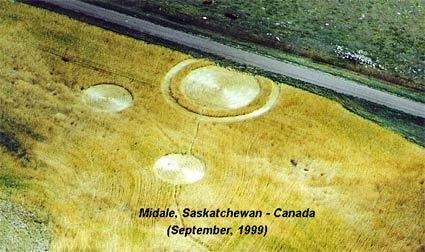 The most spectacular instance of this linear deposition occurred in a multi-circle crop formation on a farm in Midale, Saskatchewan, Canada in September, 1999.
linear deposition of magnetic particles along all radii sampled. 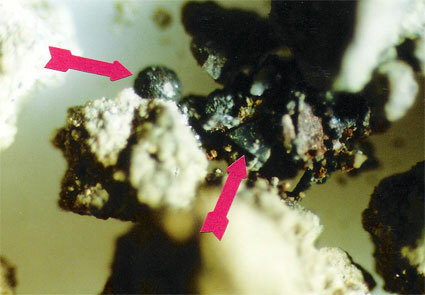 Photomicrograph (x40) of magnetic spheres and other partially ablated magnetic pariticles found in 1999 Midale crop circle soil samples. 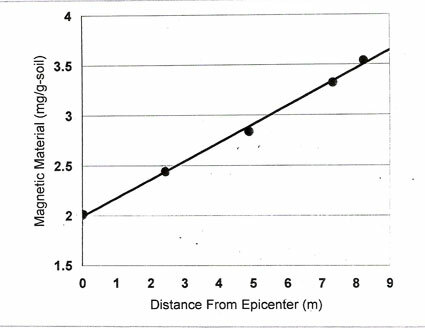 Sampling of the ringed circle revealed a linear relationship (R-square = 0.997) between the amounts of magnetic material deposited in the soils and the sampling distances from the circle's epicenter -- and this result was found in all four of the sampled radii of the 68 ft.-diameter ringed circle. from the circle center (left) out to the edge (right) of formation. This direct relationship of amounts of magnetic material to sampling location was shown to agree with the physics of centrifugal forces on particles confined in a rotating plasma system. The magnetic particle distribution found in the control soils -- soil samples taken outside the circle complex is quite different, revealing an erratic pattern of distribution. 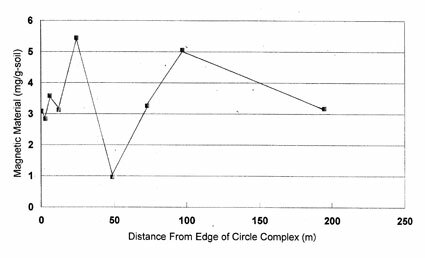 Distribution of magnetic material in soils outside the circle complex is erratic. In this particular crop formation a chi-squared analysis conducted on the wheat stem node-lengths in plant samples from the flattened center circle and also from the standiing ring showed statistically significant (at the 95% level of confidence) node lengthening when compared to the controls.